Danny Beer is a Gonser appointment to the Planning Commission. He was added to the Planning Commission in 2014. Danny was present at the September 31st Board meeting where two Planning Commission appointments were to have been made. As previously reported, Supervisor Gonser wanted to appoint two individuals with no Zoning or Planning experience. The Board did not accept his recommendations. Gonser refused to nominate other candidates that did have Planning or Zoning experience. “I was disappointed, personally disappointed, that there wasn’t more consideration given to the applicants who had a lot of experience. There were a a couple of people that were very anxious to be a part of this, with a lot of background, and I am new and have less planning experience than you guys that have at least dealt with it in your other workings. I never have. Other Planning Commission members expressed their hope that the Supervisor would nominate one or two of the candidates that have the much needed experience and have submitted their applications for the openings. He does not intend to nominate any of the more experienced people who have applied for consideration. He either doesn’t understand the type of experience being sought by the Board members who spoke on the record on the matter or he is spitefully misrepresenting their opinions in order to present himself as a victim of the Board’s refusal to support him. Why is this important to the citizens of Oakland Township? With six of the seven Board members recognizing the need for adding Planning experience to the Planning Commission, with several candidates having the much needed experience, and with a plea for help from the Planning Commission for that help, why would the Supervisor be reluctant to appoint individuals that have submitted their applications and are very qualified to help the Planning Commission? If Gonser does not take appropriate action at the next Board meeting, I am afraid the Township may get involved in yet another legal issue that will do nothing but hurt Oakland Township. 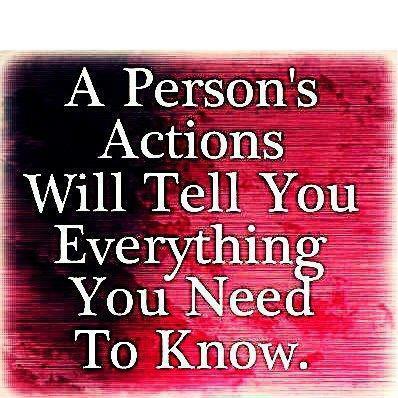 The Supervisor needs to accept reality, and do what is right for the Township, not his ego! This entry was posted in Planning and Zoning, Supervisor Gonser and tagged Abuse of Power, Dictatorship, Gonser, oakland township, Oakland Township Board, Planning and Zoning in Oakland Township, Supervisor Gonser, Supervisor Terry Gonser, Terry Gonser, Unprofessional behavior on September 2, 2015 by richardjmichalski. At the February 24, 2015 Oakland Township Board meeting, the Board announced, and approved, an employment agreement with Mr. Warren P. Brown as our new Township Manager/Superintendent. Mr. Brown is currently the County Administrator for Sandusky County in Fremont Ohio. This approval came after two sets of interviews and public ‘meet and greet’ sessions. The second set of interviews was required because several Board members had lingering concerns over how the candidates would have handled the many examples of unauthorized actions by our Supervisor. The second set of interviews apparently convinced a majority of the Board that Mr. Brown was not only qualified for the position, but would respond to Supervisor Gonser’s unauthorized actions appropriately. On January 23, 2015, interviews with three potential candidates for the Manager/Superintendent position took place. Those interviews can be watched by visiting the Township website. A ‘meet and greet’ event took place the following day where the Board members and citizens could meet and interact with all three candidates. During the January 27, 2015 deliberations regarding which candidate to select, several Township Board members were not comfortable that they understood how each of the candidates would respond to Supervisor Gonser’s attempts at assuming more responsibility than what he legally possessed. This concern drove the need for a second set of interviews, this time with more direct questions. Each Board member was asked to provide a list of potential questions. They would be consolidated for use during the second interview. “The majority of the Board has voted to continue with our current form of governance in which the Superintendent/Manager is to fully handle the duties and responsibilities spelled out in Ordinance 97 in accordance with Charter Township Act 359. However, the Supervisor continues to work full time and involves himself in significant portions of these duties and responsibilities. The majority of the Board selected Mr. Brown at the January 27th meeting, pending the final employment agreement, in a 5 to 2 vote. Supervisor Gonser and Trustee Thalmann voted against the selection of Mr. Brown. They were supportive of hiring the candidate that stated “I do not see a problem” with the Supervisor’s unauthorized actions. There have been a number of previous post on this website dealing with Supervisor Gonser’s (and Trustee Thalmann’s) repeated attempts at changing the form of governance in Oakland Township. In those posts, the reasons for having a professional Superintendent/ Manager handle the responsibilities defined in Ordinance 97 have been clearly stated. It appears that we now have a qualified, fully empowered, person to fulfill those responsibilities. Why is this important to the citizens of Oakland Township? The Township now has a well qualified, experienced, person that will be managing the Township in conformance with the responsibilities that he has been given. He now recognizes the challenges that the former two Managers/Superintendents had in dealing with Gonser’s continued efforts to perform in a “Strong Supervisor” form of government, contrary the desires of the community and the Board. He also recognizes he has the backing of the Board in dealing with any future authority issues with Supervisor Gonser. Supervisor Gonser has repeatedly corrected citizens when they state that we have a ‘democracy’. He corrects them by saying our government is a ‘democratic republic’, not a ‘democracy’. The difference is that in a democratic republic, the citizens make their decisions during the elections, after that, the elected officials are the ones who make the decisions (not the citizens). It appears that Supervisor Gonser now also understands that the Township elected officials (i.e..other Board members) have the authority to prevent a dictatorial form of government in our community. . I complement the Board for taking this long awaited action, and wish Mr. Brown a warm welcome, and a long tenure as our Township’s Manager/ Superintendent. This entry was posted in Board of Trustees, Board split?, Supervisor Gonser and tagged Board of Trustees, Dictatorship, Gonser, Maureen Thalmann, oakland township, Oakland Township Board, Oakland Township Board split, Supervisor Gonser, Supervisor Terry Gonser, Terry Gonser, Trustee Thalmann on February 25, 2015 by richardjmichalski. 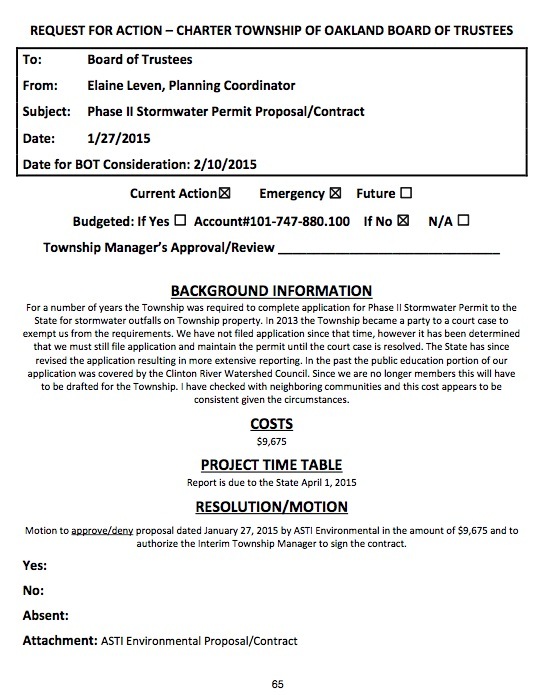 One agenda item for the February 10, 2015 Oakland Township Board meeting will be a request to pay an engineering firm $9,675 for a storm water management plan that is legally required from Oakland Township. The need for this expenditure has its ‘roots’ in an unauthorized unilateral decision that Supervisor Gonser made in May of 2013, when he authorized one of our Township Attorneys, Charlie Dunn, to request a “termination of certificate of coverage for a general storm water management permit”. This request is currently under litigation between the Township and the governing environmental bodies, and has never been disclosed to the public. The Township is still required to provide the storm water management plan while the issue is being resolved in the courts, hence the need for the plan. Former Trustee Keyes pointed out the unauthorized request at the October 22, 2013 meeting when she became aware of it. None of the other Trustees supported her when she questioned the unauthorized decision by Gonser. The decision to terminate Oakland Township’s participation in the storm water management program was made without Board approval and outside any public meeting. Supervisor Gonser made efforts to prevent then Trustee Keyes from disclosing the unauthorized decision at the October 22, 2013 Board meeting. The resultant lawsuit, related to our request to not participate in the storm water management plan, has never been disclosed in a public forum. The legal expense for the lawsuit is unnecessary, and is the result of a recommendation from our Township’s legal counsel or our Supervisor. The cost for the storm water plan is almost $8,000 higher than necessary if the Township had maintained their relationship with the Clinton River Water Watershed Council. Here is a video of the October 22, 2013 Board meeting, at which Trustee Keyes pointed out the unauthorized decision. It was at this same meeting that she announced her resignation from the Board. Here is a copy of the May 3, 2013 letter sent by Charles Dunn to the MDEQ without the approval of the Oakland Township Board. Why is this important to the citizens of Oakland Township? Supervisor Gonser’s unilateral unauthorized decision in May of 2013 has resulted in legal issues between Oakland Township and the environmental governing bodies. The decision by the Board to not participate in the Clinton River Watershed Council has resulted in an additional $8,000 expense that was totally unnecessary. The bottom line is that our Supervisor and Board have made decisions that are costing the taxpayers money (Engineering and Legal fees) that could be spent on other things needed in our Township. Oakland Township has historically been on the leading edge of best practices in protecting our beautiful Township. Other communities looked to us as an example of what to do. Under our current Board, we are now fighting the DEQ, MDEQ and the Clinton River Watershed Council. If the decision to terminate our participation in the storm water permit program was made based on a recommendation from our Township Attorney (who would certainly benefit from any future litigation as a result of that action), one must question the appropriateness and ethics of such a self serving recommendation. On the other hand, if the decision was made by Supervisor Gonser, based on what he wanted to do, without any Board or public input, one must question his motives. However, his decision should come as no surprise to the residents, given his expressed opinion on environmental issues as previously reported on this website. This entry was posted in Board of Trustees, Ethics, Legal Problems, Supervisor Gonser, Tea Party ideology and tagged Abuse of Power, Board of Trustees, Dictatorship, Gonser, oakland township, Oakland Township Board, Open meeting act violation, Supervisor Gonser, Supervisor Terry Gonser, Terry Gonser on February 10, 2015 by richardjmichalski. Were Supervisor Gonser and Trustee Thalmann’s negative votes a violation of their oath of office? One of the agenda items for the January 13, 2015 Oakland Township Board meeting was a proposal, by Supervisor Gonser, to have Oakland Township go to a ‘Strong Supervisor’ form of government in 2016. Although he had it on the published agenda, he removed the item at the beginning of the meeting. During a discussion the Board had regarding Gonser’s unilateral decision to approve the surveying of parkland in Oakland Township for a potential gas main, the ‘Strong Supervisor’ concept came up. The result of those discussions was the ‘one – two’ punch to Gonser previously reported on this website. Supervisor Gonser and Trustee Thalmann were the only two Board members who voted against reaffirming Ordinance 97, which defines the responsibilities of the Township Manager. When the Board was sworn into office, they swore to uphold our Ordinances. The following video contains excerpts of the discussions that occurred at that meeting. It is about 6 minutes long, but well worth watching if you want to understand the positions of several of our Board members. Why is this important to the citizens of Oakland Township? Gonser placing the ‘Strong Supervisor’ issue on the agenda, then pulling it off, and his statement in the January 12th Oakland Press article, appear to have been an attempt at sabotaging the Board’s efforts to find a qualified Township Manager. As you probably know, interviews for our Township manager position occurred on January 24th. Uncertainty regarding the potential longevity of the Township Manager position could reduce the qualified candidate pool. Fortunately, the Board members, with the exception of Trustee Thalmann, wanted nothing to do with that uncertainty. Treasurer Langlois, Clerk Reilly, Trustees Buxar and Bailey took very strong positions regarding Gonser’s proposal. Trustee Giannangeli, who has been a strong supporter of Gonser to this point, made it very clear that he wants Gonser to operate in conformance with Ordinance 97. Ordinance 97 is the Township Ordinance that defines the responsibilities of our Township Manager. It is an ordinance that the Board has sworn to uphold. By their statements, it is clear that the majority of the Board members feel that the Supervisor is not conforming to the Ordinance, hence the resolution to reaffirm the responsibilities of the Manager not the Supervisor. Gonser and Thalmann voted to not to support the resolution that would reaffirm that Ordinance. In my mind, Gonser’s many unilateral unauthorized decisions and actions without Board agreement (violating Ordinance 97), and Gonser and Thalmann’s negative vote on that resolution are violations of their oath of office. If they do not want to conform to, and enforce, the existing Township Ordinances that they have sworn to uphold, they should resign. This entry was posted in Board of Trustees, Board split?, Supervisor Gonser and tagged Abuse of Power, Board of Trustees, Dictatorship, Gonser, Maureen Thalmann, oakland township, Oakland Township Board, Oakland Township Board split, Supervisor Gonser, Supervisor Terry Gonser, Terry Gonser, Trustee Thalmann on January 26, 2015 by richardjmichalski.